Metal red lace comes with combination of three colors, metallic, orange, and red. 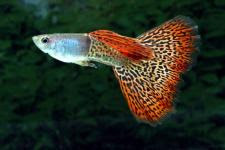 But the metallic color is a dominant color in this fish, that’s why it’s called metal red lace. As for the pattern, this strain has the snake skin pattern, similar with other red lace strain along with red back fin and tail fin.